UPDATE: VICTIM IDENTIFIED as Jerry Michael Trejo, 33, of Albuquerque. 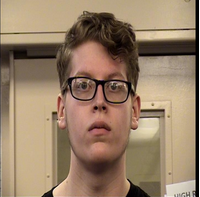 Thanks to an attentive witness and diligent investigators a suspect faces charges for shooting and killing a man near a downtown community center. Damian Hidalgo, 19, is charged with an open count of homicide. The victim has been positively identified as Jerry Michael Trejo, 33, of Albuquerque. Just after 2 p.m. Tuesday, November 22, 2016, officers responded to a disturbance call where witnesses said they heard shots fired. It happened in the Valley Area Command near the Wells Park Community Center on Mountain Road. The key witness told officers he saw a man standing over another man’s body and then jump into a car and drive away erratically. The witness quickly snapped a picture of the vehicle and license plate. Detectives were able to trace the license plate to a rental car, track down the rental company and find out who rented the vehicle. That’s when they caught up with Damian Hidalgo. Hidalgo told investigators with the Violent Crimes Unit he went to the community center to purchase marijuana. He said the victim, now identified as 33-year-old Jerry Michael Trejo of Albuquerque, who Hidalgo believed was there to sell him drugs, pulled a knife out and demanded Hidalgo’s wallet. Hidalgo said after Trejo took his wallet, Hidalgo pulled out a gun and shot him. Hidalgo said Trejo continued waving the knife around and cursing, so he shot him again. Trejo died at the scene. The Albuquerque Police Department would like to thank the witness who bravely came forward with the pictures and information and helped solve this crime. As always we ask citizens who notice something suspicious to be a good witness. Try to safely obtaining as much information as possible and quickly call police.